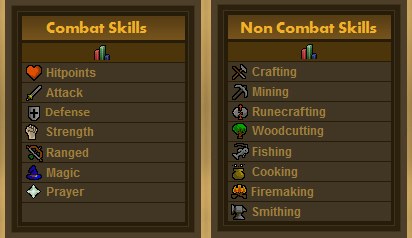 RuneScape skill guides for Free To Play servers. All Hail The Newest “Free To Play” (FTP) RuneScape Hero. Greetings Bold Adventurer, welcome to the fantasy world of RuneScape a massive multiplayer online game (MMOG). Once you complete the games tutorial and create your individual character you will have the opportunity to face hundreds of enemies in combat, complete various quests and train fifteen unique skills; seven combat skills and eight non-combat skills. The fantasy world of RuneScape is set in medieval times and divided into two continents; containing two kingdoms (Asgarnia and Misthalin), four large bustling towns (Lumbridge, Varrock, Falador and Al Kharid) and various smaller towns, outposts and villages which are scattered throughout it’s vast lands. My purpose as an experienced traveler and your knowledgeable guide is to provide you with some instruction as to how to best begin leveling your combat and non combat skills and assist you in navigating the landscape in the safest and most profitable way, while explaining the benefits of attaining certain levels within each skill. As you begin you'll find yourself in the courtyard of Lumbridge Castle amongst many other new players. Take note that if you enter the castle and use the staircase to the far left or right and head to the third floor, you will find a bank (notated by a yellow "$" symbol on the RuneScape map) where you can store various items and gold pieces (money). You may talk to the bank tutor here to gain more knowledge as to what items may be placed in your bank and how to retrieve them. If you head out of the courtyard and immediately to the left you see Phileas The Lumbrige Guide (guides and tutors are notated by a blue "?" on the RuneScape map) who is standing by to provide information and directions to new players. Also to be found in the same location is the Doomsayer - The Danger Tutor. He controls the warning signs for many of the dangerous areas found in RuneScape. Continuing north you will soon meet the Woodcutting Tutor who will gift you with a bronze axe and a tinderbox. It is for this reason you should begin woodcutting as your first trainable skill. Immediately to the west of the woodcutting tutor is the combat training building. Inside players wishing to learn the art of combat can find the Melee, Range and Magic Tutors. By working with each tutor in turn your character will learn the skills necessary to stay alive while facing the perils of the region. The tutors will provide you with all the equipment necessary to complete their lessons and thereby increase your current skill level. Copyright © 1999 - 2008 Jagex Ltd. Jagex and RuneScape are registered trademarks of Jagex Limited in the United Kingdom and trademarks used in other countries of the world. Jagex Ltd is an independent developer and publisher of online games headquartered in Cambridge, England. All screenshots and in-game graphics used on this site are property of Jagex. The RuneScape character Calypso Rain is registered to Krystin Scott.